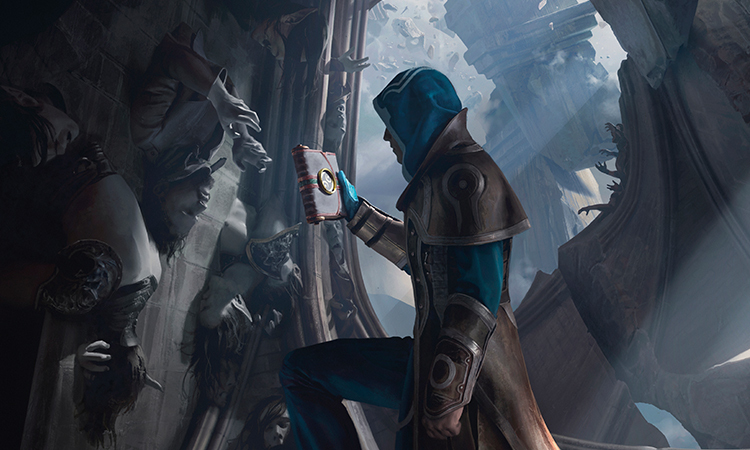 Jace Beleren's search for Sorin Markov has been beset by peril and has yielded more questions than answers. His investigation brought him to the twisted remains of Markov Manor, where he discovered a journal amid the rubble. He pursued the journal's description of the cryptoliths—twisted stones he had seen in Markov Manor—to other locations where they had appeared on the plane. It was still evening when he reached Gavony. Overhead, the hunter's moon glowered through a thick blanket of misty rain that enveloped the moorlands. Jace Beleren, Living Guildpact of Ravnica and mind mage extraordinaire, trudged through the rain in silence. An unparalleled command over telepathy did little to prevent him from half-sliding, half-falling down the slippery trails. He did, however, take some comfort in his release from the tense delusions of Markov Manor. His composure and thoughts had cleared—for now at least. In the mists, a conjured light provided visibility for little more than a few feet ahead of him. He could proceed no farther. "A world full of shadows and ghosts...and I'm the fool chasing after them," Jace mused aloud, feet squelching inside of rain-filled boots. 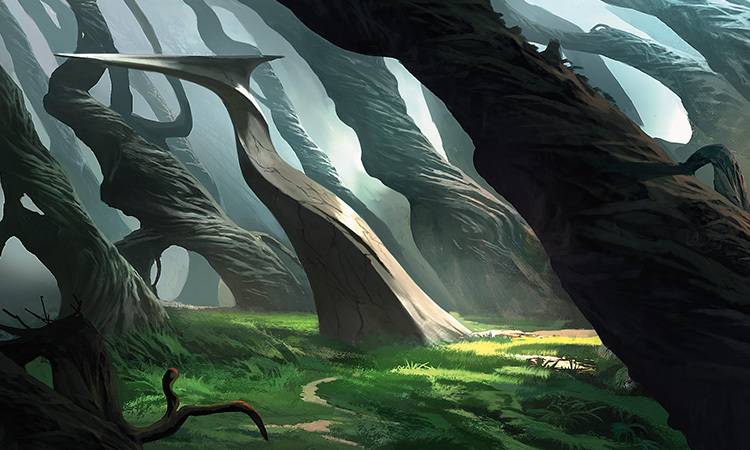 He cast a longing thought back to the marches under the capable guidance of his companions on Zendikar. Their pathfinding skills aside, the silence and solitude of his journey had started to become oppressive without them. He mused back over the familiar and distinctive patterns of their thoughts, the sounds of their voices. He—Jace's mouth twitched involuntarily—he could use their assistance. As he pulled his cloak tighter around himself, his hands caught the weight of the journal in his pocket. A neat, compact folio bound in dark leather, held shut by a delicate wrought metal clasp. The pale face of the moonfolk whose face he had seen at the Manor flashed into his mind. My paper companion, he thought wryly. He ran a cautious fingertip over the cover and up to the clasp. It fell open, pages fanned wide, each pale as a peeled apple underneath a web of script. Impossibly tidy calligraphy filled the pages, flanked by numbers nestled neatly inside of gridded tables. Jace exhaled slowly, and pulled his hood protectively over the book to shield it from the misty rain as he turned the pages with attentive care. Intricate field drawings filled the next page. An angel's wing—each feather described in painstakingly detailed line work. A gridded table of field drawings of delicately shaded circles under the boxed heading "Material Composition of the Heron Moon." A full-page image of a part-man, part-wolf, depicted in profile, was immediately recognizable to Jace as the same sort of creature as his unfortunate guide from the other night. "Well, stranger. Tell me your secrets," Jace said as he brushed the dirt off a nearby rock, sat down, and began reading. A stoic rider on a dappled gray arrived at my study unexpectedly this morning, carrying with him a most curious delivery. A burlap-wrapped parcel, easily larger than a human, required both of our efforts to heave into the observatory's foyer. The rider said little, but pointed with a soiled boot-tip toward the label written in Jenrik's scrawl: "Specimen for immediate inspection." As I removed the wrappings, my breath caught in my throat as I saw fur, then claws, then the lupine muzzle come into view—a werewolf. A cursory examination revealed it to be far larger and more complete than nearly anything else of its kind that has passed through my hands. To my great surprise, the corpse was icy cold and had been dead for some time by now. The post-mortem reversion of lycanthrope corpses to their human forms was a well-known fact that stood in harsh contradiction to the specimen before my eyes. Though quite eager to begin my work, I did inquire for a receipt confirming the time of delivery—he signed it simply "R. Karolus." The specimen was cleansed, drained, and labeled, and I began on the left anterior section. Large amounts of thick fur were first removed, revealing the sample's dermis. Though it is customary in such procedures to cover the face of the specimen, both to protect it from damage during the examination and for some of more delicate dispositions, I could not help but linger on its expression. Eyes wide and staring, its open mouth seemed to be caught in a call to something beyond the slayer in front of it in its last moments. Most likely, as so many that I had seen before, staring rapturously towards the Moon. The beast's expression brought to mind Jenrik's words to me. "The exact means by which a person is subjected to the curse of lycanthropy is unknown," he had said, "though it is closely linked to the basic nature of every lycanthrope. The sight of the moon fills them with unbearable savagery and strength, though the touch of her silver is poison." I still vividly recall my first days on Innistrad, a place of seemingly endless winter nights—the perfect slate to stage my lunar studies. As I stared up at the Heron, so perfectly full, clear, and bright that she drowned the stars, a rapturous...wildness bloomed in my heart as well. Perhaps it was the vivid memory of a past worlds away within the clouds. Perhaps there was something enviable in the lycanthrope, who did not fear to grasp that wildness and hold it close to them. Perhaps they know an ecstasy we never will, from the silvery tides of moon magic running through their veins. Hallmark colorations of a Gavony province howlpack were visible about the upper mandible. The area was marred by the presence of stringy connective tissue that had wrapped around the teeth. Closing of the jaw was likely impossible for the afflicted at the time of death. After the loss of three scalpels of Blessed Silver, attempts to make the first chest cavity incision required the use of our heavier tools, particularly a woodcutter's saw that had been hastily coated and blessed by Avacynian missionaries in the next town over. With great effort, the rib cage was separated, the specimen split from clavicle to pelvis, its contents exposed to air. I have often admired the lycanthrope's orderly interior, organs neatly packed and encased in their membranes, branching vessels traversing perfect pathways throughout. Massive lungs for communicating with their packs over great distances and for tree-lined sprints, a relentlessly effective liver for processing the flesh of their prey within minutes, heavily vascularized adrenal glands prepared to spill their contents into the bloodstream. An oblique reflection on the human form, elevated to a predator's ideal. This one, though. This one was...new. There was, in fact, little or nothing of the human form that remained within. The peritoneal interior was filled with a network of tough sinew of varying thicknesses that had grown to such an extent that it pushed aside many of the organs. Though the animal had appeared larger from the outside, a significant portion of this bulk was likely made up of such a substance. They connected in some places in thick nodules, clustered together. The largest cluster resided on what used to be the animal's liver, swollen to nearly twice its usual size. The organ emitted a foul odor—briny, rotten, and easily detectable despite my thick examination mask. I found myself surprisingly loath to excise the thing, though curiosity quickly conquered disgust. The halves separated, leaving a hard, round object embedded in one half, not unlike a sliced peach. They revealed a spongy mass of the twisted sinew studded with what appeared to be three broken teeth, and strands of thick gray fur. The pit stuck in the center of one of the halves. I rolled it over to face upward. No, not a "pit," but a sightless, yellow, lupine eye. An eye most likely staring skyward. Perhaps, as its cephalic sisters, heavenward toward the Moon. Jace looked up from his reading with an involuntary grimace. Absorbed in the entry, he hadn't noticed that the mist had cleared ahead of him. The moon illuminated his path, reflecting off the shallow marsh, silhouetting a twisting monolith. It was approximately his height, the foundation formed from raw stone pulled from the earth that quickly turned to a hard-edged, twisting shape. Staring down the axis of its tip, Jace noted that the formation pointed to another just like it a couple hundred meters away. The trees themselves mirrored the direction of the monoliths. It in turn pointed to another, and another, until they disappeared from view in the distance. For what might have been the first time since reaching Innistrad, Jace grinned, and a wave of relief washed over him. Perhaps some things might start to make sense. The monolith was unmistakably the same as those he had seen at Markov Manor, the same as he had seen in the journal. Alchemical analysis on the moorlands' cryptolith formations was completed today. It indicates a number of exceptional features of the samples received, including a high surface hardness, and a directional energy field along a twisting axis. Curiously, inspection of the striations suggests a material only recently emerged from the earth. In contrast, crystalline analysis seems to indicate the samples are far older than all other geological formations found within the area. Jace nodded. "Not methods I know well, but I like what you did here." He missed the convenient expedience of reading minds over picking through some of the minutia of these accounts. Jace held the back of his hand to the bottom of the monolith. It was cool and smooth, with a subtle network of some other lustrous mineral enmeshed in its surface. A scintillation on its pointed upper face caught his eye. As he reached forward to touch the end of it, there was a POP and a spark jumped from the end of the monolith to his hand. Jace jerked his hand backward as a thin trail of white smoke rose from his glove. The breath of something bright and bell-clear bloomed on his senses, then quickly faded. "AH—! Azor's blood, what was that!" His thoughts went immediately to the journal, and he cradled it in the crook of an arm. "Are...are you all right?" he asked the book as he scanned it for scorch marks and rubbed the cover gingerly with a corner of his cloak. "Well, did you ever find out what these actually...do? What do we make of these? Am I just following someone's trail into another scheme or trap or...?" Jace aimed a piercing stare at the journal's pages. "Or is that what happened to you?" The journal, of course, said nothing. The moor was silent, save for a rising buzz of swamp insects. Jace returned to reading. The previous week brought reports of continuing increases in werewolf-related fatalities sent by the Gavony Census, which have been confirmed by independent slayers and far exceed the numbers of Jenrik and Lotka's typical predator-prey predictions. Jace had become accustomed to a number of monikers. "Prey" was not one that sat particularly well with him. Since then, roads to the observatory have been blockaded, and further information has been difficult to gather. Many of our colleagues have barricaded themselves in their homes and abandoned their work. Resources have thinned, but I remain determined to continue my recordings on their causes. The feeding behavior of Innistrad's supernatural inhabitants is closely entwined with the regular motions of the heron moon. A celestial conductor, she commands the mysterious motions of the primal heart that lead to transformation or murder with the shifts of her tides. Jace pored over the charts on the previous page's ledger with a critical editorial eye that would have made Lavinia proud, had she seen him do so more than a handful of times as the Guildpact. "Wait a second. Hang on," Jace said indignantly to the handwritten pages. "I've seen Kiora move the entire Halimar Sea." (Or at least try to, he noted.) "And...and even if it was something that could move the tides, it would have to be huge. There's no way such a thing could have gone unnoticed!" He gave the book a cautionary glare before continuing to read. Recent measurements of moon phase durations have shown asymmetric alterations. The implication is that the moon's orbit itself is being pulled in some direction by a very large, very nearby object still invisible to humanoid eyes. Jace scanned over the night sky. A single, lonely moon looked back from a bed of hazy constellations. He probed for any of his own telltale signs of illusion magic—nothing. "You're...you're sure that's it? What happens when it reaches the plane's surface? Do we all just wait, watch, hope while this thing heads toward us?" Curiously, both the tidal vectors and the field distortion provide identical foci that may be traced to the same coordinates—a large reef off the coast of Nephalia. As candlelight flickers over my pen, I recall the lights of the soratami rites of the New Moon. We had held our festival lanterns in the ways of our forebears, beacons guiding each new moon to rise from the sea of clouds. What fruit will the reef bear to this plane? More clues, still with no answers. Jace clenched and unclenched his fists, filled with nervous energy. The evidence was infuriating—nothing to hear, grasp, or know on his own. Even his own eyes seemed useless. He had no choice but to let the journal lead him along. "Why aren't you here, in person? I have so many questions..." Jace gave a longing sigh toward the journal. Silence. "Of course. Wishful thinking." The text of the pages stared back at him, defying him to reread their final words. "I know, I know. We've found a trail in the stones, I'll—er, we'll follow it. I just...I wish I knew better what I was looking for? Trail or trap, what have you left me here?" The road to Nephalia ended at the base of its sea cliffs, and he could see the roofs of the port town of Selhoff just over the ridge. A precipitous, narrow footpath lead up the cliff side, and Jace soon found himself short of breath on the steep incline. Jace felt his way around a bend in the path, and nearly collided with a fisherwoman. "Oh! Sorry, I didn't see you th—"
Her eyes affixed to his—wide and vacant with an unblinking stare. "So...another come to listen to her call, hmm?" she asked, her words tumbling out slowly. "You've come to see her too?" An eerie simulacrum of joy crept into her voice. "So many have arrived just today!" "She's finally here! Brought her feathered ones from the sky, tide came up right on with them! Broke right through the floodwalls, washed all of it away!" Ah, of course, Jace thought—the journal had mentioned the rising tide levels. "You've seen the tides shift, too?" "Oh, we had no need for all those things—we've found...something so much more than us! Think of all these things we're holding onto, weighing us down. Living in these shells made of meat, carrying our worries, slogging forward day after day. She's up there now, waiting for us, waiting to take it all away for us, to usher in a new world!" "Slow down...'she'? Who is 'she'? What is she bringing?" The fisherwoman barked out a laugh that lingered too long. "I was like you once. It's a terrible burden, knowing. So many questions, drowning in questions, and never enough answers! Now I've let them go, washed right out of my mind like the sea over shipwrecks. But once I'd wanted to know…things. Lots of things! Silly things. What is my greater purpose and will I ever achieve it? How will I die? When will winter end? Where does the eye stare? How many eyes? How many legs on the moon shrew—?" Meaningless words flowed from her mouth until she gasped for breath like a land-bound fish. Jace had heard enough—he wasn't going to get too far with conversation, but he needed any information her mind might hold. With a well-practiced gesture, Jace reached out with his mind to grasp at her thoughts. ...and looked out into a dull, gray calm. It formed itself into gently curved walls of perfect smoothness. The roof of the dome was similarly smooth and featureless. No doors, no entrances, no exits. He looked down, expecting to see the fisherwoman's hands. Looking down, all he saw were his own damp palms and blue robes. Jace swore silently. His form was somehow trapped in someone else's mind. He was someone else's living, breathing mental figment, trapped inside of their head. Panic was beginning to set in, turning the silence into a high-pitched ringing in his ears. Deep breaths. This was…unexpected. Jace moved slowly around the perimeter of the dome, feeling the wall for cracks or imperfections. A complete circuit around the room produced nothing. Trying to suppress a growing panic, he leaned against a wall and glanced at the center of the room. A nebulous shroud of some...thing hung in the air. No, not something, but nothing. A blind spot in space that seemed to remain no matter how he tried to peer around it. Jace's pulse thundered in his temples, in tune with the blind spot in the center of the room. His sweating palms pushed against the smooth walls firmly now, though they refused to give. He had altered minds before, instilling wild visions and distorting truths. But he had certainly never been one of those distortions before. No, he was still real and true, he was certain of it. He could prove it. He took a deep breath, planted his feet firmly apart, made a fist, thumb outside his fingers as Gideon had patiently insisted to him, and took a swing at the wall. The impact resonated back through his body, and the shock through his nerves threw him backward. The walls vibrated like a tuning fork, each wave jangling through Jace's tortured brain. His eyes flicked toward the center of the room. The blind spot in his vision had swelled to become an Object far larger than Jace himself, nearly touching the floor and ceiling of the interior of the dome that trapped Jace like a spider beneath a glass. He shut his eyes tightly, gripping his head and trying to stay calm and concentrate. Jace's eyes snapped open. There stood another figure in hooded, damp, blue robes surrounded by a pale luminescence, who rubbed at his chin, staring thoughtfully up at the Object. It looked just like...Jace. Or, more accurately, one of his illusionary duplicates. "We've never seen a place like this before, huh? Thoughts are a mess, place is just empty. But fascinating! What do you think is inside this thing?" Jace gaped at the hooded duplicate, words starting to form then deflating on his tongue. He was certain he hadn't summoned it. Or had he, instinctively? He couldn't remember. Was it an effect of his entrapment in the mind of another? "Oh, come away, can't we? We're so close now!" insisted another voice. Jace turned to see a second duplicate of himself, this one unhooded, moon-pale skin visible. "We've no time to waste with this poor woman—leave her be. We're almost to the Drownyard!" The hooded duplicate shot an icy glare at the second. "And do what? Follow more of these anomalies? I'm tired of filtering through all these dead ends; there has to be someone around here who knows what holds it all together!" The hooded duplicate put two hands to its forehead and stared earnestly up at the Object. Its face reddened and two veins bulged comically on his forehead as it began to sweat profusely. Jace grimaced, watching himself with naked, harrowing self-consciousness. "You really do look like that, you know." It came from a third illusionary duplicate, this one violet-eyed and smirking. It whispered something into the ear of the second, pale duplicate and the two giggled conspiratorially, pointing at the first duplicate that was still deep in concentration. The pale duplicate composed itself and laid an earnest hand on Jace's shoulder. "Months, no, years, of physical studies, observations, measurements! You're so close to helping me complete my records!" The pale duplicate tugged on Jace's arm with earnest, impatient insistence. —His eyes snapped open to find his hands clapped over his head, his body curled up on the ground. As he scanned the trees, the shape and substance of those sinewy walls clung to his vision like phantom limbs. The fisherwoman stumbled as she came to, locking eyes with Jace in a brief, knowing stare. After a few inaudibly murmured words, she scrambled to her feet with a guttural snarl and scurried down the path away from the coast. He barely noticed her leave as he continued his climb, deep in thought. The trail ended on the rocky shores just north of the reef near a small fishing outpost. Its floodwalls, as the fisherwoman had indicated, were indeed nearly a foot underwater, and a thick, shining layer of rotting marine slime coated what had once been the dock and its ships. Boots caked in slime and sand, Jace waded into the shallows and let the waves pass over his feet. As he waited for it to recede, he realized the water was moving parallel with the shore, not away from it. Something down the beach was indeed changing the normal motion of the waves. South of the village, the moonlight shone down on a massive ring of jagged structures jutting up from the ocean, clawing at the waves and passing ships. "The Drownyard," Jace breathed. "This is it! All the cryptoliths point here!" Above the jagged ring was...still nothing? Hanging aloft in the skies above it, nothing more than the familiar heron moon. He had been prepared for a lot of things. But nothing? "I thought you'd promised me something here! You told me I'd find something!" Jace hastily fished the journal out of his pocket and flipped it open. In summary of this initial set of observations, our best explanation is the sudden migration of a large celestial Object in increasingly close proximity to Innistrad. He stared down into the empty, unfinished ring of stones dubiously. Large, but certainly not what he would classify as "celestial object" large. And the space above the ring appeared to be just that—empty space. "Uh, exactly how large were you thinking this thing is?" Taken in total, the findings presented in this work support the presence of an object of significant mass. Most likely a new astral body, an eldritch moon of sufficient size as to provide a gravitational pull able to disrupt the normal patterns of both the tides and magical energy. "Astral body? Moon-sized?" Jace looked down into the empty area above the ring. Was there another illusionist hidden nearby? He didn't sense anything of the sort. Future field studies will be arranged to investigate. Jace flipped forward, but found no more written on the topic. "You can't stop now! We're so close! Tell me! Tell me what it means!" He gripped the leather spine and shook the book with more force than he intended. Flashes of movement caught his eye. Dense clouds roiled overhead, and a long procession of shambling humanoids waded through the frigid, shoulder-deep ocean water below. Zombies. More specifically, the waterlogged corpses of long-dead sailors left within Nephalia's reef. He realized with some distaste that the stench of rotting meat was not, in fact, fish at all, but a well-brined undead labor force. The vivid memory of Liliana's zombies, their cold, rotted hands pushed up against Jace's windpipe, loomed in his mind. Jace gave a cautionary gesture, and three duplicates appeared around him. The sight of the zombies brought back Liliana's words. "This is a dead end. Go home, Jace!" she had said to him. "No—!" He insisted aloud, with a vehemence that surprised him. His thoughts were too loud. Slow down, Beleren, he instructed himself. No, he couldn't turn back. Not yet. Not when he could solve what even the journal didn't know. Jace gritted his teeth against the bracing cold of the ocean water and waded in, keeping his distance from the prying eyes of the zombie procession. The stone formations here were similar to those he had seen in the moorlands, though these were far larger in scale, and humming with energy. Their twisted forms tapered into points, each facing the center of the circle. A few of the stones jutted up from the shallows, away from the procession that gathered in the center of the circle. Jace made his way toward one of them and extended a hand to trace the stone's direction in dim light. A jolt of energy jumped from the surface of the stone to Jace with a loud POP, setting his ears and head ringing with a familiar sound. He raised his head slowly. A memory twitched. A blind spot, the Object, loomed in his vision, hovering just above the circle of stones in the distance. It pulsed with power, in time with the lustrous web of veins on the monoliths below it. 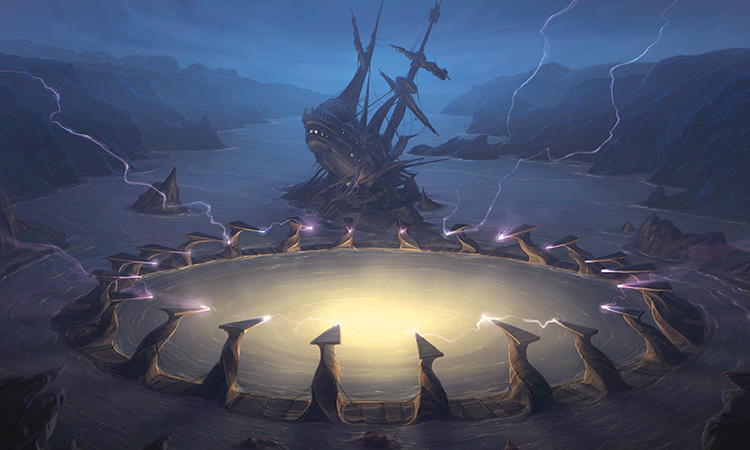 This was the nexus of Innistrad's redirected leylines, the siphoned center of its energy. "You never were able to keep your hands to yourself, Beleren. And did you really have to let that thing zap you again?" A voice came from over his shoulder. The accompanying face peered over Jace's shoulder and emphatically rolled its violet eyes. "For a famously perceptive mage, you've had better moments." It reached forward as if to tap him on the tip of his nose with an illusionary finger. Jace's errant violet-eyed duplicate from his mental entrapment just minutes ago. Behind it were the others—the hooded duplicate and the pale duplicate. "What are you doing here?" Jace sputtered. "I left you and the other..." he pointed accusingly at the other duplicates, "...errant delusions back in that madwoman's head! You weren't welcome there, and if you're not going to help us against that," Jace motioned angrily at the reeking mass of zombies, "consider yourself unsummoned!" "There's no need to be defensive. Look, you're doing a fine job of handling it already!" The violet-eyed duplicate pointed toward the center of the formation, where the pale duplicate and the hooded duplicate were eagerly advancing into the center of the ring of stones. They didn't appear to notice or care for the teeming zombie masses in their paths. "Get back here! Move!" Jace hissed under his breath. "Move back, damn you!" "—the journal. Is this...?" Jace sputtered, clutching at the book in his pocket. "I mean...is that you?" "Most likely a new astral body, an eldritch moon of sufficient size as to provide a gravitational pull able to disrupt the normal patterns of both the tides and magical energy," the soratami illusion intoned with sudden solemnity. "I need you to focus, we've work to do—and where's your compass?" it yelled back at Jace as it strode purposefully toward the stones. The hooded duplicate had already reached the base of the Object, where he stopped and stared up. "Just like in the madwoman's mind! Why did you have us leave her behind? Now we'll never know what she knew!" The shrill pitch of the duplicate's voice began to set the zombies astir. "Jace, look up!" it cried. "They're here!" As Jace turned, something fell onto his head from above and rolled off into the sea. And again. Raindrops? He held out a hand, and grasped at the next as it fell. They were...feathers? Falling from a dense cloud overhead. He squinted. No, it wasn't a cloud, it was made of moving things. Huge winged things. Angels. They swarmed in midair above the center of the circle, some wheeling near the cryptoliths like moths to a flame and calling out in harsh, birdlike tones. The sound of their massive wingbeats echoed against the cliffs and through Jace's aching head. Oh yes, he'd seen these before. The same pages that had first described the cryptoliths had described Avacyn in the same breath. A sign, a clue...it was something, it had to be something. "Impressive-looking but useless creatures. Bird wings and bird brains," the violet-eyed duplicate scoffed, leaning against Jace's shoulder. Below the swarm, the hooded duplicate only stared up at the sky, transfixed by the inexorable pull of the Object and the angels circling overhead. "What pulls the tides?" Jace heard it murmur. "Zombies or angels? What is my purpose, how will I end? Too many questions..."
It walked forward toward the center of the circle of twisted stones, up to its neck in the icy seawater, head tilted back, eyes still firmly focused upward. It continued moving doggedly forward as the waters closed over its head, entombing it below the surface. Jace watched in silence as the duplicate's face, his face, slowly disappeared. A voice spoke from over Jace's shoulder. "You remember what she told us, don't you?" the violet-eyed duplicate asked with a raised eyebrow and a smile too wide to be sincere. "Excuse me?" Jace Beleren croaked, his throat dry. "That first night when you came here to see her." The duplicate's voice had changed. It was...familiar now. The outlines of its illusionary form wavered under the moonlight, and slowly it rearranged itself to a familiar form: Liliana Vess. "I didn't come here to see her! I—I came to find Sorin!" "She knows you. She didn't ask you to come here, surrounded by the undead and those..." she flicked a hand upward in brusque disgust "...winged vermin." Liliana's voice jangled his raw nerves like a skilled violinist playing a chord. Jace stopped in his tracks. Of course. He'd known it all along, hadn't he? "It was you! You brought them here! That was why you'd sent your ghouls after me, why you'd warned me about angels when I first arrived?" Jace could feel the blood rising in his face and could hear his voice, grating and shrill against her calm. He stepped forward to face her. "This is your doing! You've always hated them, and you've been planning this for years, haven't you? You're the one who redirected the stones to herd the angels here and twist their minds! Lambs to the slaughter, all gathered together for you to cut down in one blow. How did you do it? What do you have planned? Do you know what forces you're toying with?" Blood pounded in his temples; beads of sweat rolled off his brow. "Answer me! I'll not let you make a fool out of me!" "You don't need my help for that, Jace. And you...you know better, don't you?" Though illusionary, Liliana's eyes were the same ancient, depthless violet that Jace had remembered. They brimmed with terrible secrets crafted from lifetimes of ruthlessness. 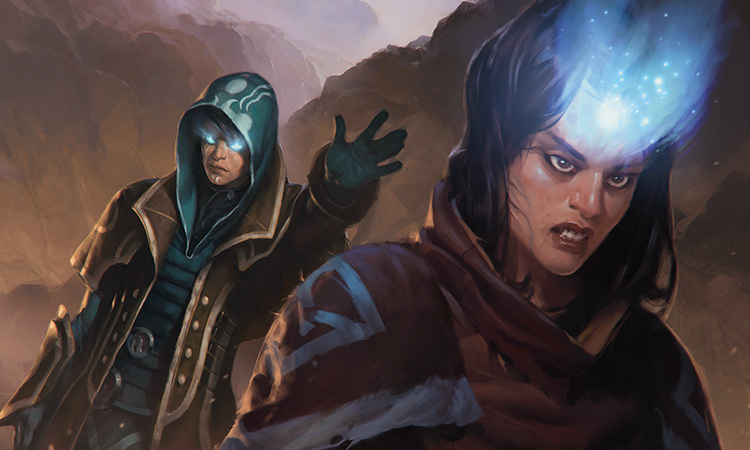 Frustrated words and accusations piled up in Jace's throat as he stared at the Liliana illusion's smiling face, but as he started to speak, it suddenly dissipated into the cold night air. Jace made his way back to the shore and sat alone, shivering in the dark. His robes did nothing to keep the chill from his bones, and his numb feet refused to regain feeling. He was unhurt, but shaken. In front of him, the procession of ghouls continued on, undisturbed by Jace's passage. He looked back at the circle of stones. The Object had disappeared. His shaking hands went to the journal, but stopped as they went to flip open the cover. 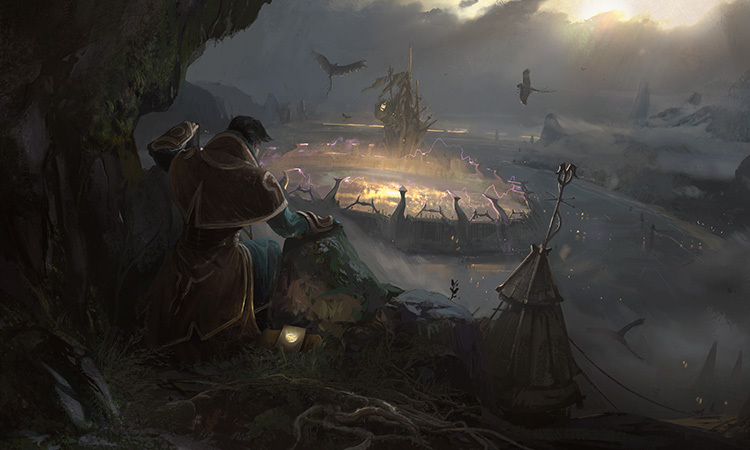 Questions still flooded his mind—how had Liliana moved the tides, or the stones for that matter? What was the astral formation that the journal had insisted on? The words of the journal lingered in his mind: "For every answer, three questions..."
No, a dull, buzzing voice reverberated through his mind. Stop asking. Too many unanswered questions. You don't need the book and its bottomless well of mysteries. They'll drown you. Jace shoved the book away into his robes. You've come this far. You know the answer. Stop searching. He played the images over and over again in his mind—unable to erase the image of Liliana's face and its mocking smile. The hunter's moon hung alone in the sky expectantly, its silvery light seeming to cleanse the land and sea it illuminated. Jace knew what he had to do.